At first glance, CO2 emissions growth from fossil fuels and industrial processes look fairly benign for developed countries. Compared to a 1990 baseline, emissions peaked in 2007 at just 0.4% above the baseline and then dropped for the next two years (based on UNFCCC data). By 2009, emissions for developed countries were 8.7% below the 1990 level. This drop, of course, wouldn’t have happened without help from the global financial crisis. But there is more to this story. Soon after, in 2010, global CO2 emissions increased by the highest recorded rate as the world bounced back from the financial crisis. Emissions for developed countries followed suit but remained well below the 1990 level. Does this mean that emissions in developed countries have stabilized even as their economies continue to grow? The missing piece of the puzzle is the significant increase in outsourced production starting in the mid-1990s. When production is outsourced to developing countries, developed countries see relative stability in their territorial emissions, which are emissions produced within their geographical boundaries. But in reality, emissions are relocated to the developing world and outsourced along with the production. When finished products are delivered to consumers, those emissions are embodied in the products but are not attributed to those consuming the products. The reporting protocols today are designed for territorial emissions, so outsourced emissions remain entirely with countries that produce goods and services for export. The chart below (from Peters et al. in Nature Climate Change) captures the net effect of international trade and shows how consumption-based emissions have increased much more rapidly than the production-based territorial emissions for developed countries. The situation in the US appears worse. Territorial emissions peaked in 2007 at 20% above the 1990 baseline and were 7.9% higher by 2009 before full recovery from the financial crisis – well above the emission growths of developed countries as a whole. Adjusted for net international trade, consumption-based US emissions grew even faster than that relative to baseline – over 29% higher in 2007 and nearly 16% higher in 2009. In the chart below, I have combined data from two sources (UNFCCC and Peters et al in PNAS) to approximately plot the US emissions profile through 2009. Data for 2010 are not available yet, but the post-crisis US emissions are likely to have resumed their upward trend. We can expect current annual US emissions to be roughly 8-9% higher than territorial emissions after adjusting for trade. This may look like a small increase in the grand scheme of things, but it makes it much harder to return to the reference emissions of 1990 at the national level (according to the IEA, emissions need to be roughly at the 1990 level by 2035 in order to keep the average global temperature increase under the 2 degrees C). Back in 1990 when the US was less dependent on imports, trade would have increased emissions by about 1.5%. The first takeaway from all this is that a full system perspective is needed to really understand things like national and regional CO2 emission trends. As any LCA practitioner will tell you, how system boundaries are drawn can make a big difference. Second, consumption of material goods continues to drive increases in emissions even as a big part of the production is outsourced. Despite transitioning toward a more service and information based economy in recent years, there are no signs of emissions leveling off anytime soon in the world’s largest economy. When Tesco recently announced its decision to drop carbon footprint labels from its products, it wasn't so much a Shakespearean dilemma but simply a matter of the excessive cost and time involved. There probably isn't enough money in the world -- or time -- to label everything that we produce and consume with accurate carbon footprints. More importantly, consumers haven't asked for it. The most common consumer response to these labels is confusion, followed perhaps by irritation at having to look at one more number when they're simply trying to grab that gallon of milk and be on their way. This doesn't mean that carbon (or other) footprinting is dead. But it does mean that the exercise of footprinting products and organizations needs to be rethought. The question is, what can we really do with the carbon footprint metric? We know that the carbon footprint tracked over time is not only a good indicator of energy use -- including reliance on fossil energy and transition to renewables -- but also of energy and material efficiencies, waste reduction, land use and other resource uses. It is hard to compress all of this into a single number, so the carbon footprint is never going to be a perfect measure of environmental impact. There is, in fact, an excellent analogy with another widely used single metric, and that is time. Lean processes -- ubiquitous now in many economic sectors -- are based on the premise that compressing time reveals hidden quality problems and that their resolution leads to more efficient, cost-effective business processes. Now, time is not a perfect measure of quality either, but it works reasonably well not only in manufacturing but also in service industries [PDF]. Lean has been successful because it is always easier to understand and optimize one variable -- in one dimension -- rather than multiple variables that may or may not be correlated. Lean processes can be green as well in many cases, but that is not necessarily true [PDF] in general. After all, they haven't been optimized explicitly for low environmental impact. That is really where carbon comes in. Analogous to the use of time in lean processes, carbon can be the single variable to optimize in what we might call clean processes (what I really mean, of course, is cleaner processes). Note also that lean service processes -- such as health care delivery or auto repair [PDF] -- may require some modest changes in consumer behavior, but these are usually not painful changes. Consumers are often delighted by the changes, which involve same-day appointments, minimal waiting (compressing time! ), and highly streamlined operations. In the same spirit, successful clean processes cannot impose additional burdens on consumers -- and that includes comparing carbon footprint labels. It is also inefficient to leave all the optimization to consumers, who can only choose between finished products or choose to consume less of something. If there is an opportunity to take carbon out of a product, it should happen before the product (or service) makes contact with consumers. This means higher efficiencies, lower waste, better choice of raw materials, and ultimately cleaner products and processes that are fully optimized for carbon. The business case for doing this would be to reduce the cost of production and delivery of anything, while providing a more pleasing experience to consumers. There may well be additional reasons for carbon footprinting, such as reporting and transparency requirements. But these often get entangled in incomplete analyses and partial disclosures where the aim is to shore up a corporation's green credentials. To take the time and care needed to do the footprinting right, companies need more compelling primary reasons. Nothing is more compelling than an improved bottom line and potentially happier consumers. Greenhouse gas emissions are at record highs. The world's major emitters recently failed once again to reach an agreement to limit emissions. In the midst of all the gloom and doom, it is understandable that the International Energy Agency's latest World Energy Outlook has not received the attention it deserves. But anyone seriously concerned about climate change needs to understand two fundamental constraints that emerge from this report. How we respond to these two constraints will determine if there is a reasonable way forward on climate change. The first constraint has to do with trajectory of energy-related CO2 emissions required to keep the average temperature increase below the commonly accepted 2 degrees C threshold [PDF]. 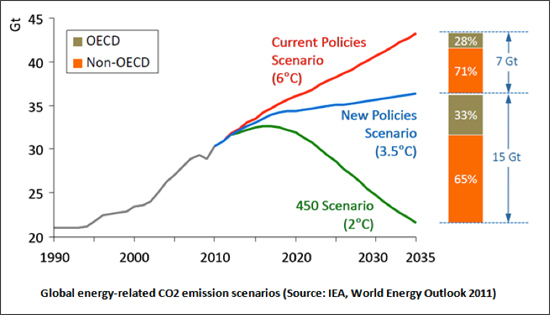 In the graph below, the IEA calls it the "450 Scenario" where the atmospheric CO2 concentration stays within 450 ppm. It requires emissions to peak around 2017. 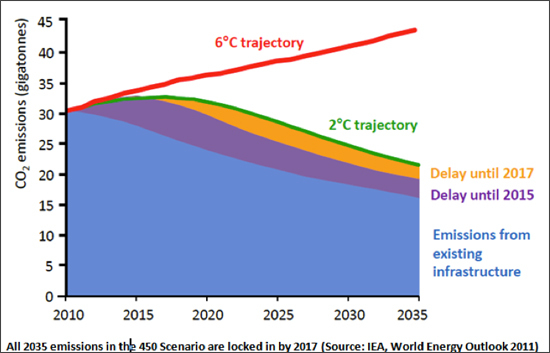 By 2035, emissions in the 450 Scenario need to be just half of what we would have in the business-as-usual Current Policies Scenario. The difference between these two scenarios is as much as 22 Gt CO2 per year by 2035, about two-thirds of today's total energy-related CO2 emissions. Before we ponder how to find those reductions with current and future energy technologies and efficiencies, here is the second constraint that makes the task even more difficult. If we take no further action by 2017 -- a likely situation -- emissions locked in by existing capital stock (such as power plants, buildings, factories, and vehicles) will use up the entire carbon budget for 2035, leaving no maneuvering space to achieve the 450 Scenario. As the graph below shows, these locked-in emissions will ramp down as older capital stock is phased out over time, but all replacements and expansions will have to be zero carbon! The IEA estimates that demand for primary energy will increase by one-third between 2010 and 2035, and 75 percent of all the energy will come from fossil fuels in 2035. The new BP Energy Outlook concurs with this trend and estimates an 81 percent share for fossil fuels in 2030. The 450 Scenario will be out of reach without rapid breakthroughs in renewable energy, battery technologies, biofuels, and carbon capture and storage (CCS). Unless, perhaps, if we are willing to think outside the box. What if we could find practical and affordable emission reduction and sequestration opportunities outside of the energy realm that could offset a big part of fossil fuel emissions through 2035 and buy us the additional time needed for a full transition to clean energy? 1. Black carbon reduction. About 18 percent of global warming is caused by black carbon, a result of incomplete combustion of both fossil fuels and solid biofuels. Black carbon stays in the atmosphere for several days to weeks, and works by absorbing light and radiating out heat. The heated air molecules last longer and can move long distances. Black carbon also reduces the earth's reflectivity (known as albedo) when deposited on snow and ice, which further increases warming. Solutions include: reducing particulate emissions from diesel vehicles; transitioning to clean-burning biomass stoves, brick kilns and coke ovens; and banning agricultural waste burning. There are large non-climate benefits by way of avoided premature deaths and reduced health costs and, to a lesser extent, avoided crop losses. Black carbon is expected to figure prominently in the next IPCC report. 2. Methane reduction. Methane emissions from oil and gas production, gas transmission, coal mining, municipal waste, wastewater, rice paddies and livestock manure present a mitigation opportunity similar in scale to black carbon. Non-climate benefits include avoided crop losses, avoided premature deaths and lower health costs. 3. Carbon sequestration via fallen-log burial. Dead trees on forest floors decompose in about 10 years, releasing carbon into the atmosphere. Slowing down the decomposition to a longer time frame (100-1,000 years) by burying or storing the fallen logs in anaerobic conditions could potentially sequester large amounts of carbon at a relatively low cost. The potential is estimated to be around 10 Gt of carbon each year. There are risks, however, such as nutrient lockup, habitat loss, disturbance to forest floors and soils, and the need for some road construction. If these risks are managed well, while utilizing just a small part of the potential as I have assumed here, the impact could be substantial in the short term. I have summarized rough estimates of climate change mitigation potentials, costs and benefits (by 2035 and beyond, in today's dollars, using current technologies) for the three solutions in the table below based on literature sources. More than half of the 22 Gt CO2 gap between Current Policies and the 450 Scenario could be closed using these three solutions alone if they are ramped up to scale before 2035. In conjunction with advances in clean energy, efficiencies and conservation, these solutions could put us within striking distance of meeting the 2 degrees C challenge. An approximate annual cost for the three solutions is about $238 billion at full scale, with the returns from enhanced crop yield and health benefits far exceeding this amount. Moreover, investments in these solutions would stimulate local manufacture and employment, and climate change mitigation by itself might have some additional monetary value in the future; however, the benefits are substantial even without including these. While the non-climate benefits of black carbon reduction are greatest in the regions where much of the emissions would be reduced – particularly China, India and other developing nations in Asia and Africa – they do not necessarily go to those who might bear the costs. In addition, methane is fairly well mixed in the atmosphere and the benefits of methane reduction are more global. This means that most of the mitigation will probably need to be funded by public means, particularly where the air pollution comes from public infrastructure, residential sources, small businesses and farms. Air quality regulations could be another mechanism to cut back on industry-generated black carbon and methane. There are several additional opportunities at varying levels of cost, benefit and risk. Here is a sampling of some simple as well as grand ideas: soil carbon sequestration using biochar [PDF]; utilizing a larger percentage of the fallen-log burial potential; painting roofs white in regions with low winter heating needs (could be particularly effective with black carbon reduction); harvesting fallen logs to produce eco-neutral fuel for existing coal-fired power plants; and large-scale irrigated afforestation of subtropical deserts. All of this suggests that there are plausible trajectories that can keep the long-term average temperature increase under the 2 degrees C limit. In the short term, any such path would involve readily available technologies, a highly engineered approach, modest public spending, and benefits that extend far beyond climate. Climate change seems to have taken a back seat lately both in policy debates and business strategies. But this is generally not the case in the research community, where rigorous analyses of climate change mitigation proposals are being published regularly. Herewith are six lesser-known recent findings that help separate the promise from the hype. About 18% of global warming is caused by black carbon, which is not a greenhouse gas. A result of incomplete combustion of fossil fuels and solid biofuels, black carbon stays in the atmosphere for just days to weeks and works by absorbing light and radiating out heat. The heated air molecules last longer and can move long distances. Black carbon also reduces the earth’s albedo (reflectivity) when deposited on snow and ice, which further increases warming. Black carbon reduction could emerge as a major climate change mitigation technique with significant health benefits. Among greenhouse gases, methane emissions present a mitigation opportunity similar in scale to black carbon. The energy industry (oil and gas production, gas transmission, and coal mining) and waste handling (municipal waste, wastewater, and livestock manure) are two large contributors, both of which have readily available technologies to control emissions. Lower methane levels also help increase crop yields. When dead trees on forest floors decompose, they release previously sequestered carbon back into the atmosphere in about 10 years. Slowing down this decomposition by burying or storing the fallen logs in anaerobic conditions could potentially sequester large amounts of additional carbon for hundreds of years at a relatively low cost. The mitigation potential is larger than that of black carbon or methane. There are risks that would have to be managed, such as nutrient lockup, habitat loss, disturbance to forest floors and soils, and the need for some road construction. Can afforestation (planted forests) sequester enough carbon to seriously mitigate climate change? Since afforestation reduces surface albedo and increases absorption of solar radiation, the net benefits are generally low and even negative in some cases. A simulation study has shown that afforestation is much more effective in the tropics – owing to the higher evapotranspiration – than in temperate and boreal regions. There is at least one interesting proposal out there to “end” global warming through irrigated afforestation of subtropical deserts. Can white roofs be part of the solution to tackle climate change? White roofs do reduce the energy needed to cool buildings in the summer, but could increase energy use for heating in the winter – which might more than offset the savings. Moreover, while white roofs do cool urban surfaces – counteracting the urban heat island effect – they reduce cloudiness slightly and allow more sunlight to reach the earth’s surface. And the light reflected from the roofs cause some additional warming through absorption by black carbon. The likely net effect is additional warming of the earth – except perhaps in areas with low winter heating needs and in conjunction with black carbon reduction. Does composting always produce lower greenhouse gas emissions than landfilling organic waste? Composting does require energy for turning the piles in order to minimize methane emissions, but finished compost could replace synthetic fertilizer. On the other hand, landfills do generate methane, but increasingly much of that is collected and used as fuel or flared. Plus, landfills provide carbon storage through the undecomposed portion of the waste. One recent study found that windrow composting of yard waste produces significantly higher net emissions compared to using that waste as alternative daily cover in landfills equipped with gas collection.